It was a 3-1 winning night last night with the NHL Tips. We bet on two “obvious” favourites to win in regulation and thankfully both did so as the Bruins and Lightning both won comfortably. Those are always nerve wracking bets to make because hockey is so volatile and it can be so frustrating being on the losing side of those games. Pretty pumped about my call on the Jets game yesterday. Initially looking to back them to bounce back, the more I looked into it – especially with Comrie in net – I felt this was a game that had over written all over it and that came in. I hate betting against the Panthers anyway – I find they’re always a competitive team win or lose and it can be tough watching it if you’ve backed their opposition. Our loss was an annoying one and one where I feel I made a basic mistake. However it’s a good lesson for any new gamblers out there – you’ll make mistakes. It happens. You just have to learn from them. I’ve been gambling for more than 20 years and it was my full time job at one point in my life – yet I still made a basic mistake yesterday that I’ve made many times before. When we were going over the tips, Scott suggested Stars/Blues Over 5.5. I looked into the data behind that one, however for some reason I looked at the data via rose-tinted glasses; basically I was looking at the data WANTING to back the over 5.5. There’s no specific reason for that – it was just one of those things where in my head I thought “Hey I like this bet”. And it’s not like it was the worst bet in the world – however I chose to focus on facts that would support the over 5.5. One big one would be the Stars goalscoring on the road this season – they’ve been extremely poor on the road overall. However I focused more on their last 3 games where they had scored 3, 7 and 3. And I didn’t even look that closely at each of those games – those numbers were enough to justify the over. So it was just various things like that. Then I present the facts to Scott to go over but the facts are tilted in the direction of the over and it makes it look more appealing than it was. We’ve been having a good run the past week so over confidence was probably a factor too and we didn’t look at it as closely as we should have. Hell that’s usually the best thing with 2 people working on the tips – we’ll usually play devils advocate with each pick etc. But that didn’t happen there, and it hurt what would have been a perfect night. There are so many mistakes in sports betting you can make like that and I’d like to say you’ll learn from them but that’s not always the case. The main thing is not to go on “tilt” due to them – don’t get frustrated and make silly bets or anything like that. That’s the biggest thing you can learn – never go on “tilt”. The last time I went on “tilt” was 2002 or 2003. I can’t remember exactly but there was a midweek game in the English Premier League between Aston Villa and Manchester City. I had looked at the stats and was 110% convinced it was going to go over 2.5 goals. I bet double my usual max bet on it – breaking my strict bankroll management rules – and guess what? It lost. I think the final score was 1-1. I was furious with myself and I ended up betting my whole bankroll on a random womens basketball game where the point spread was 18.5. At the time I’d never even heard of the WNBA, and I knew very little about basketball – I just felt 18.5 points was ridiculous. Very, very stupid on my part but being on “tilt” can be scary. As it is I woke up to discover the team lost by 18 points so I just barely avoided losing my entire bankroll that I’d been working on for over 3 years at that point. All those hours grinding away at deposit bonuses via various sites could have been for nought if there had been one missed free throw. In summary you’re going to make mistakes while betting sports – don’t let it affect you like that. Instead try and learn from the mistakes and learn from the losses and also the wins. 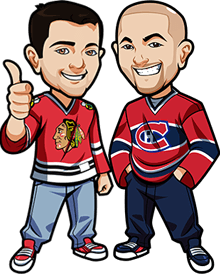 Me and Scott aren’t celebrating a 3-1 night; we’re looking at each bet we made and asking ourselves “Should we have taken Bruins -1.5 instead of in regulation?” and “Neither of us liked the Habs yesterday – but did we miss something by not backing the Flames?”. If you want to actually make money long term from sports betting, you’ve got to treat it that way and put the work in. Whew okay – let’s get on with the tips for tonight. FYI it looks like when the odds listed for a game are 6.5 or 7, the game has went over around 85% of the time over the last 2 seasons. Holy crap that Pens/Islanders game yesterday – what a crazy one that was! This was an interesting one because the odds came out late. Prior to the odds we were discussing it and liked the Jackets but weren’t too sure how they’d be priced. We thought if they were an underdog we’d need a good price. As it is they’re pretty decent favourites but that’s just tilted them in our favour. Funny how that can be – but it’s good that Vegas has the same value for them as we do. Torts read this team the riot act after their last game. Which is kind of funny considering the amount of shots they got and the run that they’re on but I really liked that – it shows that he feels they’re much better than that and he doesn’t want complacency to be an issue. We like the Jackets to come out motivated and do the business tonight. Despite that these teams have had enough games go to OT that we’ll include that. Caps/Rangers over was close to a play for us. But the two seem to tighten up when they play each other and the Caps aren’t a team you can fully back. Do like it to go over though but just not enough for us to tip it convincingly. Hawks/Sabres is such a mess of a game – I want to tip Hawks in reg so bad. However Forsberg has been a disaster so far. Which would lead me to the over except the Blackhawks offense is very unreliable this season and well you know how the Sabres defense are. Update @ 12:48pm EST: Crawford is in net for the Blackhawks so tipping Hawks tonight in regulation. Have to go with that one considering their 5 game winless streak – great time to turn it around. Double units if you do unit betting. OHL Betting Tips (16-7, +9.20u): Sarnia Sting in reg 1.62 odds. System likes Sault Ste Marie in reg too but only 1.29 so can add that for 2.09 if you want the gamble. WHL Betting Tips (14-13, -1.1u): Everett Silvertips in regulation at 1.95 odds. Lethbridge Hurricanes in regulation 1.45 odds. KHL Betting Tips (17-13, +2.31u): Avtomobilist 1.90 odds incl OT/SO. Metallurg in regulation 1.71.